[Smacking forehead] Now why didn’t I think of that? Cutting down on food intake doesn’t excite most of us. But substituting lower-calorie dishes might have more appeal. How to accomplish this? That’s just the question Alanna asks in her blog, A Veggie Venture. In a post entitled How to Eat More Vegetables, she proposes “practical tips and ideas” for adding more vegetables to our diets. She invites other bloggers to share some of their suggestions. In this post, I oblige. Kitchen Riffs doesn’t spend a lot of time advocating a vegetable- or health-centric point of view (as will be quite apparent when I get around to blogging about chocolate mousse). But vegetables actually do occupy a prominent place on my dinner table. Why? Well, they taste good. (Yes, honestly, they do, at least the way I cook them). In fact, they often are more satisfying than the presumed “stars” of dinner, like meat or fish. So how does Kitchen Riffs add more vegetables to meals? Read the weekly supermarket ads from back to front (usually the produce specials appear toward the end of these ads, with meat specials at the front). Figure out what veggies you want to serve for the following week, and then decide which protein would work best with your produce choice. Set a goal to cook familiar but underused vegetables in new ways. For example, while we all eat sweet potatoes for Thanksgiving, most of us rarely serve them the rest of the year. But Sweet Potato Soup makes an excellent and tasty meal starter. Sweet Potato Chili makes a great main dish. Or try roasting your sweet potatoes. Speaking of roasting, remember that it’s a great way to “kick up” flavor in vegetables. 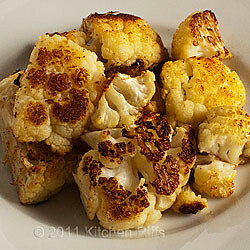 Roasting is a terrific – I’d say the best – way to prepare cauliflower. To roast vegetables, you first clean them and cut them into bite-size pieces. Then toss with a little olive oil, add salt and pepper, and spread them out in a roasting pan. Roast in a 400- to 450-degree oven for about 30 to 40 minutes, turning vegetables once or twice. Easy. Decide to try new vegetables periodically. Belgian endive? I see it all the time in my supermarket, but I’ve never cooked it. Shame on me! Expect a recipe sometime this year. Explore ethnic cuisines. Many Indian and Chinese recipes use vegetables to great advantage. These recipes can appear a bit intimidating when they contain long lists of ingredients, some of which may be unfamiliar. But the cooking techniques usually are straightforward. A good example would be my Simple and Quick Vegetable Stir-Fry. If you aren’t close to an ethnic market that carries the necessary ingredients, you can still find an amazing variety online. Amazon has almost everything you’ll probably need. Make a point of browsing blogs that feature vegetables. For a start, I recommend Alanna’s A Veggie Venture which I mentioned above. Another source of interesting recipes is Vegan Yum Yum. Look over some cookbooks that feature vegetables. I’m partial to Bert Greene’s Greene on Greens and James Peterson’s Vegetables. Greene’s book is out of print, but it’s available at many libraries. It has a particularly “American” orientation towards vegetable preparation. Peterson’s book is widely available and features an interesting range and variety of recipes. I love a big honking piece of meat as much as the next person — but not every day. At least, not anymore. In my youth, I was blessed with both an enormous appetite and a metabolism that refused to add weight to my frame no matter how much I ate. Now? Well, all I have to do is walk through the bakery department in my local supermarket (no samples, mind you) and I swear I’m a couple of pounds heavier when I get home. Fortunately, veggies make it easier for me to fill up with less fat and sugar. The General Strategy? Just Do It! We all know that vegetables add fiber to our diets, which makes us feel full faster. We also know they are great sources of vitamins and other essential nutrients. And of course we know they’re good for us. But do we eat enough vegetables? Unless we make an effort to do so, probably not. Fortunately, a little effort is all you may need. Once you decide to let vegetables take a more central place on your menus, you’ll discover a world of flavor and texture that will make you wonder why you put up with “meat and two sides” for so long. It may be true that many of us should “eat less” to keep our weight in a reasonable range. But eating “less” can mean eating more vegetables.